ALIASES: Brother Isaac (Episcopal Seminary nickname); Little Prince (High School nickname). EDUCATION: High School Graduate. Masters Degree in Child Psychology at University of Texas. Incomplete studies at the Episcopal Theological Seminary of the Southwest (Austin). OCCUPATION: Caseworker for Child Protective Services / Part-time on-call F.B.I. Field Agent for S.P.E.E.D. task force: STEEL RAIN (classified). KNOWN RELATIVES: The Reverend Delvin (Del) & Sun Yip Isaac (parents). ORIGIN OF ABILITIES: Darin began noticing his psychic abilities in his mid-teens. This began with his empathy, moving forward to stronger powers year by year. After high school, Darin enrolled in the Episcopal Seminary with intentions of becoming a priest. His friendship with a young boy at the orphanage his seminary worked with would change that. Darin's friend, Otis, was a troubled youth who flew into fits of rage, directed primarily at the priests and counselors of the seminary. Taking a risk, Darin probed the child's mind, finding a horrific series of sexual molestations performed by Otis' primary counselor, Father Joel Chipowski. Darin waited for a moment of clarity in Otis, then asked the boy point blank if he wished Darin to wipe out the memories of these events. Otis heartily agreed and Darin proceeded to take several sessions to rid his friend of those memories. Otis improved, but Darin couldn't erase his own visions of the events. Darin struggled until, finally, he felt Fr. Chipowski need not only to be stopped, but to be punished. Darin entered the priest's mind uninvited, initially intending to attempt a healing of that psyche as well. Not only did Chipowski fight Darin mentally, the saturation of a sexual predator's thoughts sent Darin reeling. Losing his hold, Darin made a final psychic attack, driven by feelings of protection, revulsion and justice. Chipowski was left in a permanent vegetative state. Darin left the seminary shortly after the events, sickened by his own violence, drawn to the mutant phenomenon, and at odds with the church upon admission of his own homosexuality. Darin finally opted to join Jim Smithers campaign to form a Super-Physical crime task force, and became a member of Steel Rain. He has retained the friendship with his more emotionally balanced friend, Otis. ABNORMAL BIOLOGY/ABILITIES: Odyssey is psychic, showing a brain which makes far more use of its capacity than the average human. He has a range of psychic abilities which break down into 3 major abilities and several minor ones as follows: Psychic healing: This is Odyssey's primary and most used ability, having nothing to do with the fad spiritualism of the same name. Odyssey is able to heal most any wound or disease that isn't instantly fatal or genetic by what is called "Molecular Biological Telekinesis" combined with a form of telepathy and "psychic sight". He first links to the target's mind with telepathy, both for purposes of understanding the symptoms and to calm the target emotionally and physically (disconnecting a great portion of the pain or even slipping a target into unconsciousness). Odyssey then uses his psychic sight to mentally visualize the area he will work in. Finally, he begins to affect cell growth, telekinetically move tissue and foreign objects, and control bodily systems from the immune system to the cardiovascular using his M.B.T. Not only can Odyssey perform miracle operations in record time, but he can accomplish what would be impossible by physical means. Odyssey can remove bullets, seal wounds, mend limbs, control hemorrhaging, resupply blood by hypergrowth, and even regrow severed limbs. He is capable of performing in minutes or even seconds the equivalent of 5 months of recuperation and healing. The greatest disadvantage to the use of this ability is that, despite the high level of physical strain this kind of psychic concentration demands, Odyssey is unable to block the sharing of the physical sensations by the target. Essentially, he experiences all the pain involved in healing at such an accelerated rate, which is not unlike experiencing the damage in reverse. Odyssey, however, does not have the luxury of any type of anesthesia or passing out, therefore exercising this power is almost always excruciating for him. Empathy/Telepathy: These more common psychic abilities are very strong in Odyssey. Not only is he able to read surface thoughts and emotions with ease (to the point of picking up stronger thoughts and emotions on accident), but with effort Odyssey is able to dig deeper into the psyche of most targets even to the subconscious and memory. These deeper probes are always detectable, more time consuming, and even can be fought as the subconscious and memory portions of the mind are often difficult for even the same conscious mind to access easily. Odyssey is able to easily "speak" into the minds of his targets, even to the point of creating a network between several minds at once. This is often used on field operations by Steel Rain for communication and coordination, especially under conditions of stealth. By the same token, Odyssey is able to project emotions into a target's mind, which he uses as his primary means of offense. Being a pacifist, Odyssey prefers to attack his opponents in this non-harmful way. Odyssey can amplify any existing emotion in a target to debilitating levels, causing his opponents to fear him immensely, trust him unquestioningly or simply be completely disinterested in the current events. Odyssey has occasionally, though seldom, turned multiple opponents against one another (again, he avoids this since it tends to lead to violence, and some animosity must already exist for this affect). Telekinesis: Odyssey's primary means of defense and last resort means of offense are in his substantial telekinetic powers. Odyssey is capable of telekinetically lifting up to 1 ton of matter, enabling him to also telekinetically strike with the force of a high-powered rifle or shield himself from most any caliber of gunfire. Finally, Odyssey can make limited use of other minor psychic abilities. Odyssey has a psychic "danger sense" or clairvoyance which enables him to usually detect imminent danger upon himself or those around him. This does seem somewhat limited to his direct area and is usually only a split-second warning. On a similar line, Odyssey appears to have a somewhat unpredictable and uncontrollable precognitive ability, occasionally overwhelming him with images, sounds or feelings about persons, places or events in the near future. These are usually related either to his acquaintances and friends, or events of large scale, such as high-fatality incidents, etc. 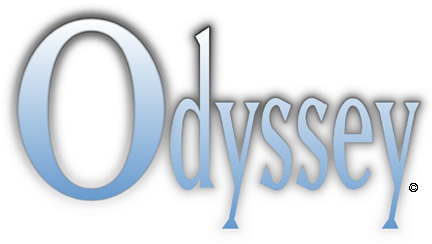 Odyssey can occasionally receive empathic waves and memories from places or objects as well. Odyssey has also been known to repair emotional damage to a target's psyche, usually by erasing certain memories or balancing certain chemicals. These efforts usually take many hours or even days to accomplish, however, and are seldom performed.